100% cotton fabric with quatrefoil design. Grey in color This is a beautiful off white cut chenille geometric design upholstery fabric, suitable for any decor in the home or office. Perfect for pillows, cushions and furniture. 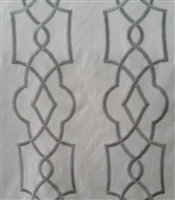 grey embroidered geometric band trim. 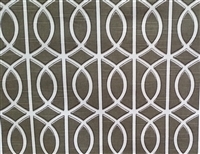 This trim is also available to order in other colors. Geometric velvet stunning tape trim. One of a kind! Great for upholstery or drapery.